Yeast (synonym: cerevisiae, Blastomyces) - stationary single-celled that do not contain chlorophyll microorganisms belonging to the class of marsupials mushrooms. They reproduce by budding and division. Well-developed in the acid medium (pH=5.5 to 6.0) at a temperature of 25-28° both aerobic and anaerobic conditions. Yeast and their disputes poor stability to high temperature and killed by boiling. 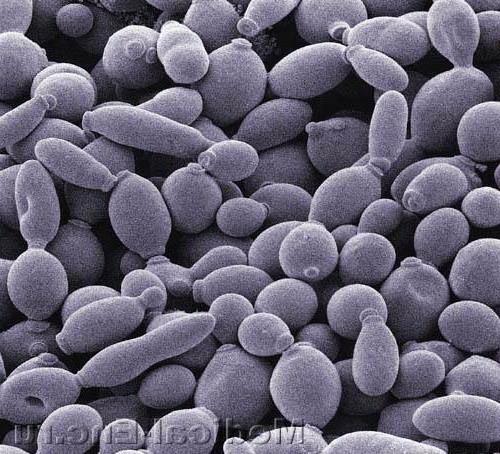 Disease caused by yeast-like fungi, referred blastomycosis (see). Yeast is widely used in the food industry (bakery, brewery, dairy) because of their ability to brivati sugar with the formation of carbon dioxide and ethanol. For the food purposes, the use of dry yeast, fresh and fluid. Yeast contain complete proteins, ergosterol (provitamin D) and b vitamins Century For the enrichment of food proteins, vitamins, you can add the yeast. Yeast belong to the perishable products, so the period of storage of compressed yeast at a temperature from 0oC up to 4 OC to 10 days, liquid yeast - 6-8 hours. The therapeutic use of yeast. The most commonly with the medical purpose apply beer and Baker's yeast in natural form or in the form of special products (yeast treated liquid, dry, hepatitis and others). The ingestion of liquid yeast stimulate the secretion of gastric, pancreatic and intestinal glands, improves absorption of nutrients. Dry yeast less active. Drugs yeast increase the body's resistance to infections. Daily dose (average) of fresh yeast-100 g of dry - 25 g, yeast paste - 50 g, liquid - 500, the Dose set depending on portability. Side effects: eructation, a sense of gravity in the epigastric region, bloating, diarrhea. Contraindications: diseases which should limit protein and purine bases (uremia, exchange polyarthritis).